Rather than allow the Johnson Peanut Company to fade into oblivion, Glenda Long and Brenda Sweeney -- the granddaughters of one of the company's founders, Hess Long -- purchased the retail portion of the business so that an Oklahoman tradition could continue. 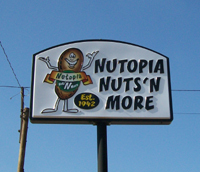 Visit Hydro, Oklahoma and the newly dubbed Nutopia Nuts 'N More or order some great peanuts online to keep the legacy alive well into the future. Earl Johnson started working for Long Produce, owned by Horace "Hess" Long, around the year 1936. In 1942, Earl and Hess started in the peanut business. In the early years, peanuts were dug with one blade bow hooked to a cultivated frame. Men walked behind the digger and hand-shook the peanuts,then laid windrows. The following days they used pitchforks and bundled peanuts into shocks to air dry. The shocks or bundles were then loaded into a bundle wagon pulled by horses or tractors and hauled in the threshing machine. A bell City thresher was used and was taken from farm to farm during the harvest season. The women would provide meals and hand-sewed the sacks closed after the men filled them with peanuts. Earl would go to the farmers' fields and grade the first sack of peanuts. The harvest of 1942 yielded approximately 2,200 tons of peanuts which were stored in various barns and buildings around town. Some were stored at the city park in a barn that Earl and Hess had built for the fair exhibits. Growers were paid $98 to $144 per ton for good dry peanuts. After Earl served in the Army, he returned to Hydro and pursued his previous business relationship with Hess Long. 1950 was a peak year for peanuts, yielding approximately 3,000 tons. In 1952, irrigation was introduced in the local farm area. 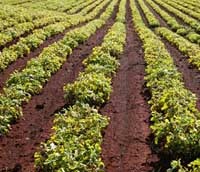 Yields increased and the quality of the peanuts greatly improved. Earl and Hess worked together until 1962 when Earl started Johnson Peanut Company. Peanuts were shipped by rails to the shellers. Earl and his children, Judy and Ron, and their families worked in the business. Earl died in 1987, and Ron and Judy continued to run the business together until 1994 when Ron became sole owner of the Johnson Peanut Company. 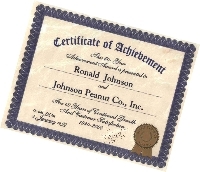 In 2000, Ron was awarded a Certificate of Achievement for "60 Years of Continued Growth and Customer Satisfaction." In 2007, Ron Johnson lost his brave fight against cancer. That same year, Verlin Long, the son of Hess Long, also fought and lost against cancer. Understandably neglected during the family's battle, the Johnson Peanut Company hovered over the brink itself. A legacy begun in 1942, was ending. Glenda Long could not allow that to happen. 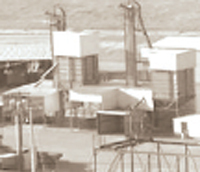 The Johnson Peanut Company had provided for and built her family. It provided for and built many families -- of the farmers, the seasonal laborers, the plant workers, the truckers, etc. 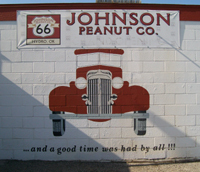 A favorite stop on Route 66, the Johnson Peanut Company had even provided memories for 1000s of families and road-trippers. Glenda decided to rescue the company from the brink and keep an Oklahoman legacy alive. Visit us today in Hydro, Oklahoma and help keep the Route 66 establishment thriving. Not only can you enjoy the best local peanuts, pecans, and delectable candies, you can also sign our guest book and add your name to history. We'll even give you a free sample to hook you. Can't make it to Oklahoma? No problem. You can order any of our nut products online. Just click the button below and start shopping.